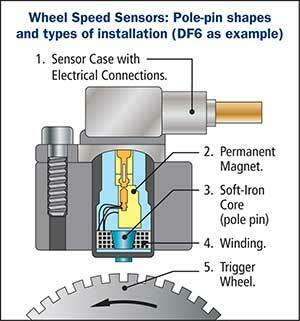 What Technicians need to know about wheel speed sensors (WSS). These can be broken down into two main types. A typical inductive WSS comprises a coil winding surrounding a soft iron core connected to a permanent magnet. This sensor requires a rotating trigger wheel to induce an alternating current in the coil that is proportional to the wheel speed. Note: This type of WSS does not require an external power supply to produce an output signal and generally utilises a 2-terminal connector. Slow speed signals can become inaccurate on this type of sensor. Increased wheel speed = Increased Amplitude and frequency. Tooth shape, air gap, strength of internal magnet and corrosion/wiring condition all have an effect on the WSS output signal. Due to these factors, most manufactures now utilise the Active WSS types. Unlike the passive type WSS sensor, the active type requires an external power supply to function. This voltage may range from 5V to 12V and may be greater on some systems. This digital Hall Sensor WSS generally utilises a two terminal connector directly on the sensor or on the sensor harness like the passive type which may create confusion for the technician on the type of sensor fitted to the vehicle. Some may have 3 terminals. 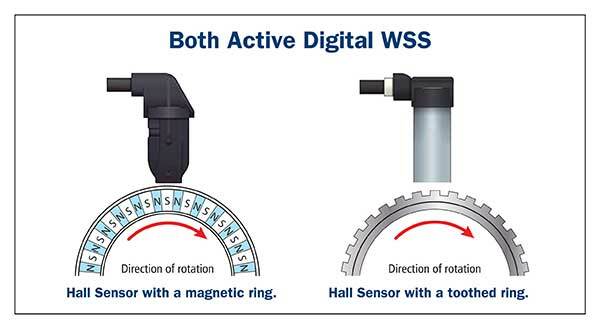 This digital WSS may be triggered either by a series of opposing magnets around a multipole ring (may be called an encoder or ABS ring) or using a toothed ring similar to the passive type. The active system can accurately monitor all wheel speeds (including stationary) and dual element sensors can also monitor reverse rotation of a turning wheel. 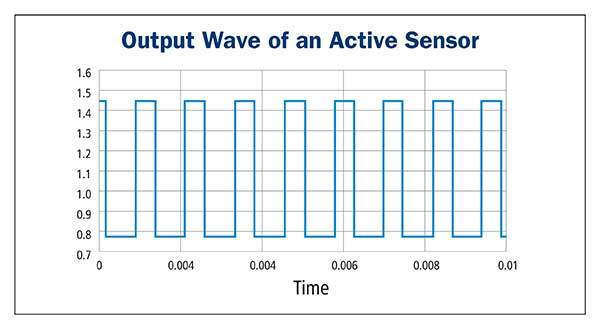 This digital sensor creates a square wave digital signal. Use of Wheel Speed Sensors. Speedo operation on many vehicles. Visible physical damage from trigger wheel movement or fitting procedure to the WSS itself. Open circuit internal sensor windings. Weak magnetic field over time. Damaged / faulty WSS harness. Damaged or loose trigger wheel creating incorrect signal. Excessive air gap between sensor and trigger wheel. Visible physical damage due to contact between sensor and ABS ring resulting from incorrect fitting procedure. No voltage supply to sensor. Incorrect axle bearings with no magnetic trigger fitted. A fault in the wheel speed sensor circuit will generally log a fault code with the warning light displayed. A suitable scanner is generally required to access the stored information on most vehicles. (unless the vehicle is a very early model). Note: ABS modules have been known to be problematic with no access to any stored information with or without scanner. If a WSS fails and the ABS light is displayed, the ABS / Traction / Stability Control systems do not function until the fault has been rectified. Warning: It is important to quickly diagnose and repair this condition to ensure safe driving. 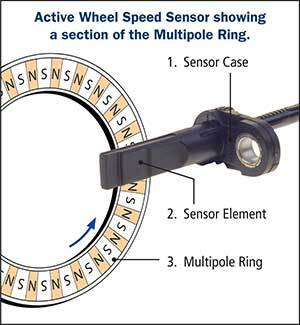 The ABS wheel sensor is typically located in each wheel hub / rotor with some RWD applications have the sensor mounted on the rear differential housing. Testing both Passive and Active WSS on and off the vehicle. A fault code indicating a WSS fault requires thorough testing prior to parts replacement. Typical test procedures will vary depending on the type of sensor fitted to the vehicle. Typical Passive and Active WSS test equipment. PlusQuip EQP-111 Wheel speed sensor and circuit tester. The Oscilloscope may be used to monitor both passive and active WSS output signals and the Technician is required to interpret if the signals are correct for the rotating wheel condition. The PlusQuip EQP-111 Wheel Speed Sensor and Circuit Tester may be connected to both passive and active WSS for testing the signals as well as for short and open circuits and can be connected to the harness of the ABS module to test the internal WSS circuits in conjunction with the use of a suitable vehicle scanner. 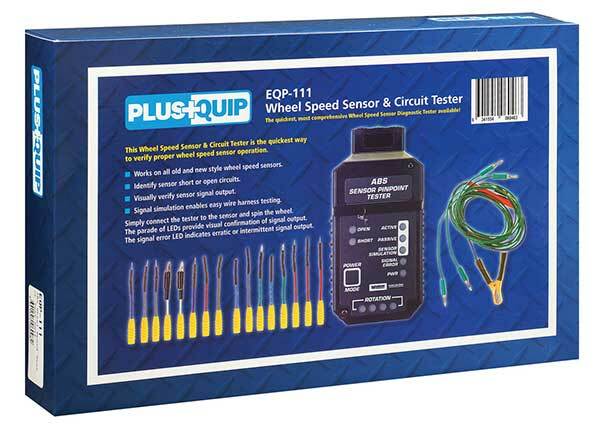 To see more information and watch a demonstration video of the PlusQuip - EQP-111 Wheel Speed Sensor and Circuit Tester click here. The suitable vehicle scanner will allow for each wheel speed sensor to be monitored during a road test or may be used in conjunction with the EQP-111 test unit. The Premier Auto Trade Sensors range includes more than 330 Wheel Speed Sensors (WSS) , covering over 6.7 million vehicle applications in Australia and NZ.